From I-44 exit #45 turn west on Hwy-49, get in left hand lane. Follow sign to the Apache Gate Entrance. Less than 1/4 mile, turn left to the gate (road is hard to see at night). This gate road is just past Burger King. There's no signs for this road/gate. Go into the Apache gate (note: gate closed on Sunday). Follow road for about 2 miles. 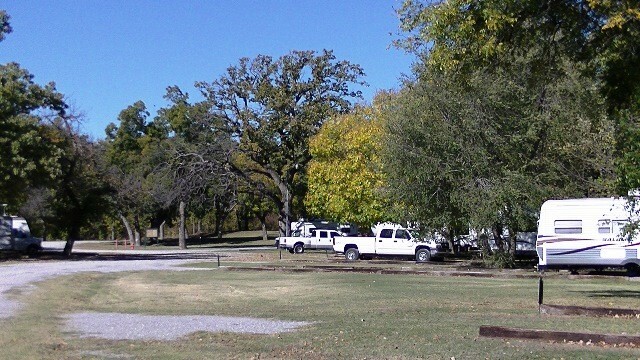 The small campground is on the left immediately after golf course. Check in is at bldg 2502 RECPLEX on Sheridan Rd. Active, National Guard, Reservists, Retired, 100% DAV. DoD/NAF Civilians. Accepted up to 2 months in advance. Highly recommended for FHU site. Not available in the RV Park. 15 day stay limit. Located in a beautiful shaded park. Rental trailers available on site. Small campground. Previously not well known or advertised. Medicine Park is an outstanding facility to stay at. We stayed overnight on our way to Texas. The pads are level with crushed gravel. We had 30 amp service, water, and sewage at our site (#3). 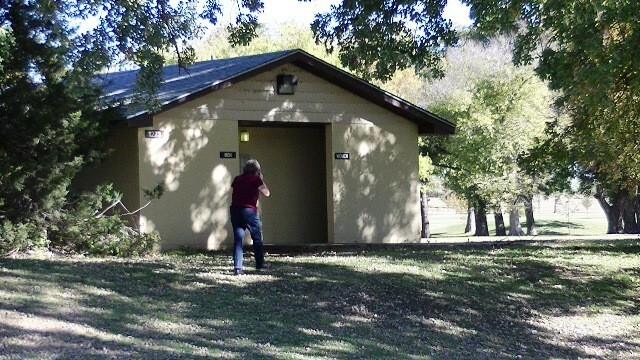 The restrooms were with 100 feet of our pad. The restrooms were clean and well maintained. The only reason I gave the place a 4 star rating for facilities is there is no showers available. The park like setting is awesome. For $17 a night I would HIGHLY recommend this park! There aren't sufficient words to praise this park. It is freshly renovated with level packed gravel spaces. It is a park like setting, very clean and well groomed. There are deer browsing and an owl close by. Ft Sill is a historic post with plenty of sights to see especially the quadrangle. The nearby Witchita mountains are not to be missed. Who knew Oklahoma had mountains! We didn't use the bathrooms or showers, instead we brought our own. We found the people in the park friendly and helpful as well as the MWR staff. Soon there will be a sign at the entry of the park where your reservation will be posted to eliminate any confusion upon your arrival. There are no signs to guide you to the fam camp but the gate personnel are very helpful and the park isn't hard to find with simple directions. The location worked for visiting family on base for one night but we were late getting in an it was very difficult to find in the dark and NO signs on base directing you. The bathroom was very dirty and there are NO showers. We always use the shower facilities as we have a smaller camper and use the shower for a closet. 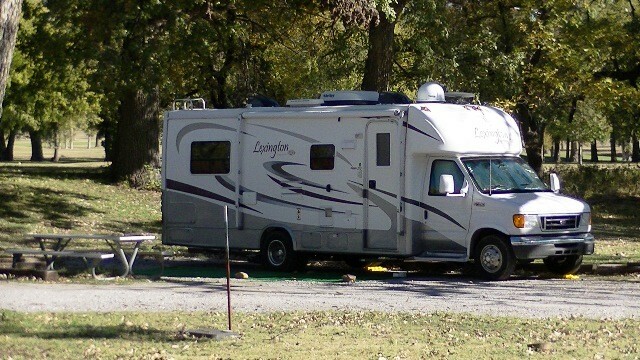 The post has all the facilities you might need but the campground has none. The value was not good because you had none of the amenities that the other bases have and you pay $13-$30 a night with full facilities. The overall experience was further degraded by the campground office was closed until 1130 on Friday so we had to leave late so that we could pay for the night after they opened. I guess a dishonest person could have just left like they had never been there since there is no oversight on the campground but we waited. Well, it is a full hook up park close to main post. It is near a creek and there is sort of a little park area where deer graze and geese wander in season. The sites are dirt/gravel and in fall the leaves are plentiful. Hook up all worked. I've been there twice and both times got site 1. The sites are mostly taken up with folks there on TDY or incoming PCS. The down side to site 1 is that it is near the bathroom at the corner of the golf course, sort of dual hatted. It seems that contractors on that part of the base like that bathroom so they pass near frequently during the day. There is a big dead/dying tree over the site. I note this because a branch about three feet long and 4" in diameter landed on the top of my coach making a nice scratch and eliminating a windshield wiper. Hopefully they'll get that under control. The place is what it is. Its not fancy but it is cheap and close to main post. There is no host and you probably won't see anyone from the Outdoor Rec crew. I did see the bathroom cleaners once. Their log seemed to indicate that they come by every three days or so. 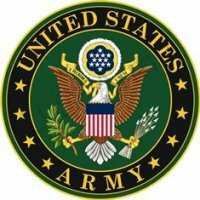 Found this info on the Ft Sill MWR page. We have stayed there before and are headed that way now. 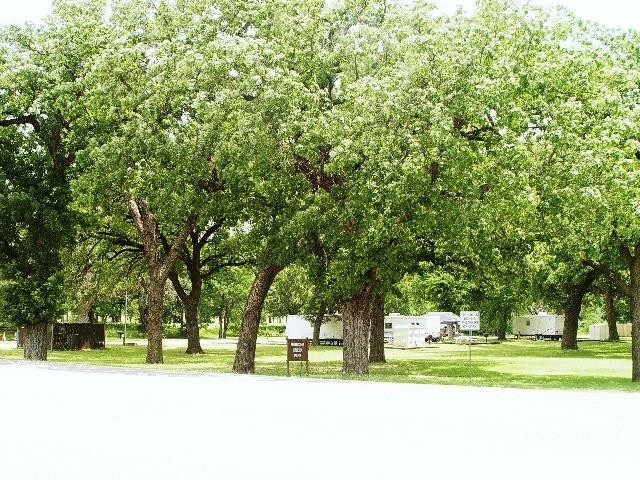 Medicine Creek has a beautifully shaded RV park located along the banks. 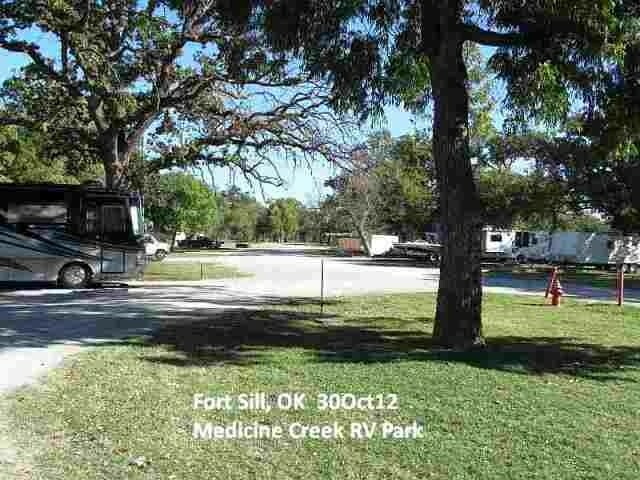 Apache Gate Road, Fort Sill, OK 73503 There are six full service sites, two rental camper sites and two dry pads with no service. Check-in and check-out is noon daily. This is the perfect place for visiting friends & relatives. Personnel in PCS, ETS, TDY status and retired personnel are encouraged to use the park. Reservations may be made by visiting the Equipment Check-out Center or calling during regular hours. Sponsors may make arrangements for their non-military guests. Full Service Sites $17/Night $390/Month Dry Pads $5/Night Rental Campers $40/Night Equipment Check-out Center Hours of Operation Monday-Tuesday 9 a.m. - 4 p.m. Wednesday-Thursday Closed Friday 11:30 a.m. - 4 p.m. Saturday 8a.m. - 12 p.m. Sunday & Holidays, Closed (580) 355-8270 *Personnel arriving after duty hours may call ahead and receive a site number, then check-in the next day. PLEASE NOTE - A RESERVATION GUARANTEES YOU A SPACE IN THE PARK- NOT A SPECIFIC SITE. We managed to get a site & the campground was not full. The Location is much better than Lake Elmer if you're just looking for a place to stay. It's much closer to base facilities. It's surrounded by a park & very quiet. Our reception for phone & mifi were so so, but we managed. We did not use the restrooms so cannot comment on that. Outdoor rec, where you make your reservation, isn't open a couple of days during the week, so that makes it hard to find out if there is availability. We were going to go there again, but couldn't get anyone to answer the phone & didn't know if there would be a spot available, so we opted for another place. The price is right if you can get in. Some directions ... If coming from the south, east or west stay on 62 to the Sheridan road north exit. This takes you in a gate without any difficult barriers. Stay on Sheridan and the RecPlex will be on your right. Suggest you turn right just before the building then left 180 degrees to the parking in front of the building. Exit the RecPlex and return to Sheridan Road north. Stay on Sheridan until Fort Sill Blvd and turn left. Stay on Fort Sill Blvd to the end and turn left going past playgrounds. 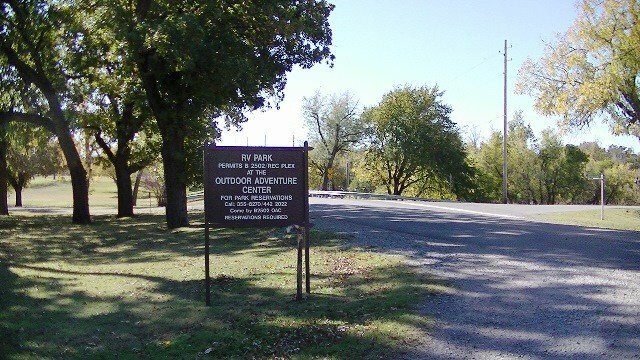 Turn right at the end of the road and immediately across the bridge is the campground on your right. NOW! First and foremost ... rates increased by slightly more than 4% 1 Sep 2013. Rates are now $17.00 per night and in MHO knocks the ratings way down for this park. This site (yes, I know it isn't official) as well as their own pamphlet where one pays AND the rates posted at the campsite still reflect $12.00/night. When asked about the increased costs and the discrepancies in published data the employees simply shrugged and said it wasn't their job, they just do what they are told. The folks at the RecPlex where one must register, while pleasant, were not helpful whatsoever. No instructions on how to get to the campground were given and no information about the surrounding area was available. (Yes, I asked.) And this is the main recreation complex for the base. All we were given was a very compressed map of the post on one side and Lawton on the other side. (After I asked.) The appearance of the campground suffers from the homesteaders and the grounds are kind of rundown. And the rental units are the worst as far as appearance goes. 30 Amp electric only, no showers and the restrooms could use attention. They seem to be used quite a bit by golfers in the know out on the links. I saw many tire tracks from carts and even saw them parked next to the restroom building a couple of times. The playground seems used more by locals than the campground residents and NO ONE seems to leash their pets. The only saving grace for this location is the trees. All sites to the north of the road should be able to get satellite and we had good 4G Verizon internet while here. If you must have trees, OK. I haven't checked to see if Lake Elmer Thomas rates increased as well. (Once again, the folks at the check in had no idea saying it's managed by a different organization.) If you can't get into Elmer or the rates are high, save your money, drive 50 miles west and stay at Altus AFB for $15.00. (Visited while at Sill) Also agree to what was posted on the 9th of November. There was one space open when I went there but did talk to one camper; he said that he had the same problems that I had trying to contact someone (the reason I stayed at Lk Elmer). There issues of getting in here, if there is a Graduation scheduled the spaces are taken quickly. The big advantage is, it’s just minutes from all the facilities on base, museums, stables, golf and almost anything else you can imagine. Like it was said before, $12 bucks is a great deal. Visited this RV Park to check it out. Campground was full, except for the 2 dry camping sites. Pretty and quiet location, but nothing real fancy. Restrooms are getting old and showing their age. They were not very clean, but not real dirty either. 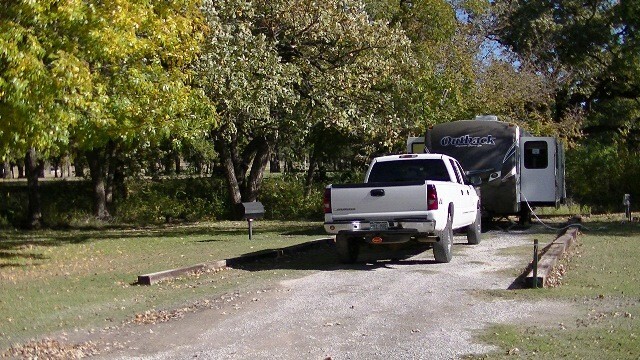 A couple FHU sites are taken by rental trailers, leaving only 6 FHU sites for campers. Some other sites had long-term campers in them. For the current rate of $12 for a FHU site, this is still a good deal. Small park with 7 sites, two dry sites and 5 full hook ups. Don't depend on the bathroom facilities. Gravel sites under trees. Trees did not help much with the 103 degree temps, but better than nothing. Very convenient to main base (two minutes.) 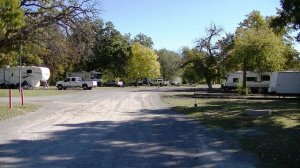 There is another RV park on Post, with many more sites with full hook ups, but it is 8 miles from main post out by the lake and I have not seen it. We have a daughter stationed here so this park is great for us. I would stay here before the lake park, if you can get it, especially if you are planning to do things or visit people on main Post. As stated in a previous review, limited sites because of the rentals. A couple more sites had the homesteaders, complete with boat and numerous vehicles. The site I had was #1 and it had a turnaround right beside it. The bathroom was directly behind the site, so every construction worker zoomed into the turnaround on the gravel drive making their quickest dash to the bathroom, dust a-flying. Bathroom wasn't stocked, so I guess they brought their own. The sites were okay, with new railroad ties being installed marking the sites. The site was full hookup and all worked well. The RR ties do need a break in between to allow sewer hose to remain level for dumping. The site was on the direct approach for the AAF and several flights during the evening were loud, but tolerable. I'm previously a cannon cocker and loved the impact sounds. We are prior military staying on a military base listening to the sound of freedom and will never complain about that. Loved the deer in the area everyday. I will stay again. Very nice place, but call for reservations before coming -- they only have about 4 or 5 spots since some of the sites are filled with MWR trailers that are for rent. Sites 3, 7, and 8 are satellite friendly. Birds, squirrels, and the ever present sound of freedom from artillery practice. Stayed two nights and loved. T.L. left this review using the Directory software: Couldn't get local TV, but managed to get satellite thru the trees, not too many leaves on the trees this time of the year. Had a wonderful experience. For the first day, I was in overflow until my spot opened up. Grass was a bit high in the overflow, but was still a quiet place to park. I was parked in spot #4. 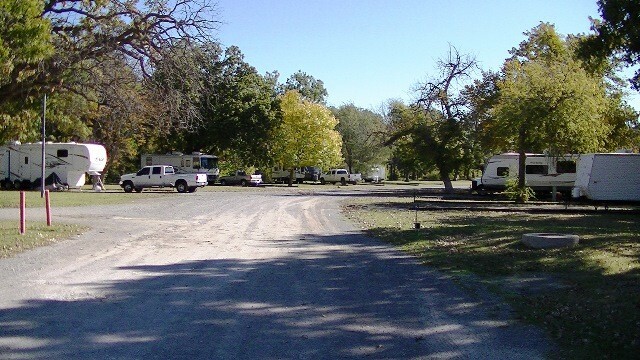 Large lot, plenty of room for a large rig and several vehicles for visitors or a boat. Will definitely return with my family! We just began Fulltimming and this was our first stop. Very nice campground, quiet, refreshing, located among trees. Grassy sites with full hookups. Great people at MWR friendly, helpful and seem to enjoy helping others.